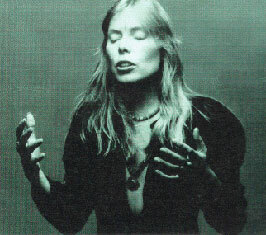 Joni and Larry Klein (co-producers), win the Grammy for Best Pop Album of the Year for TURBULENT INDIGO. Andy Garcia announces the winner of the Best Pop Album Grammy goes to TURBULENT INDIGO, Joni Mitchell (producer & artist) and Larry Klein (producer). Receiving a standing ovation from the audience Joni and Larry take the stage to accept the award. A lively bantering between the two of them at the microphone ensues. The 38th Grammy Awards were held at the Shrine Auditorium on Wednesday, February 28, 1996. The awards recognized accomplishments by musicians from the previous year. Broadcast live on Wednesday, February 28, 1996 on the CBS Television Network. So wonderful to see this award!